A Houston bakery found a way to pay homage to both Christmas and Hanukkah in a single cake. HOUSTON (KTRK) -- A priest and a rabbi walk into a bakery...and this Chrismukkah cake walks out. Three Brothers Bakery here in Houston crafted this masterful Chrismukkah cake to celebrate the two winter holidays, which very rarely fall so close together: one half of the cake is decorated with snowflakes and Christmas colors, and the other half is adorned with the Star of David and Hanukkah blue. This year is the first since 1978 that the first night of Hanukkah happens on Christmas Eve. 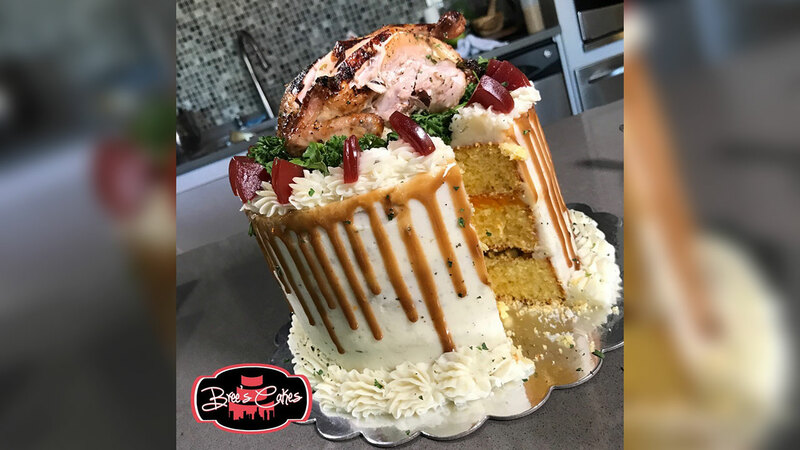 Everybody is in search of a sweet cake to cap off their Thanksgiving dinner, but one baker has flipped the script and concocted a cake full of meaty Turducken goodness.